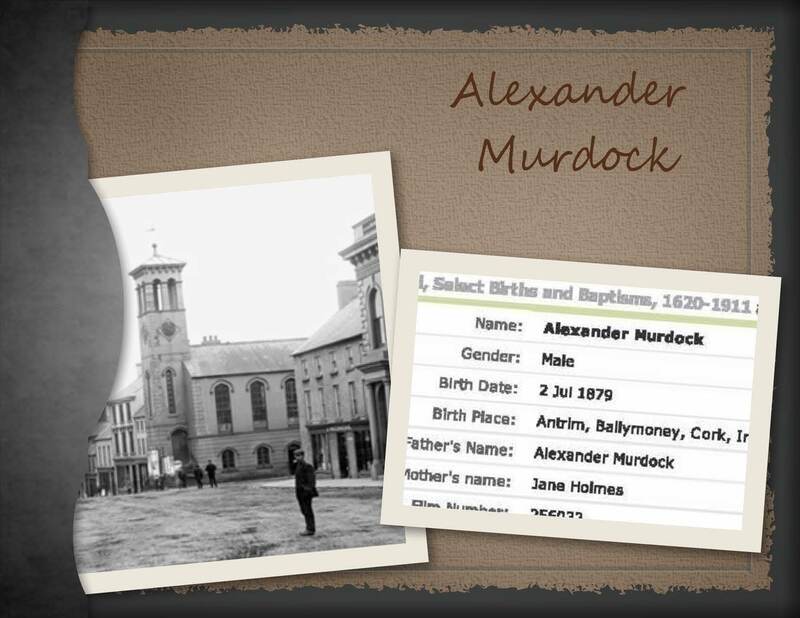 Alex was the middle child of three siblings born to Alexander Murdock and Jane Holmes. His parents married in the Ballymoney Reformed Presbyterian Church on 7 Jun 1877. His older sister Annie was born in 1878 and his little brother Archie was born in 1881. Sadly, just before Alex’s sixth birthday, on 15 Mar 1885; his mother passed away at the very young age of thirty. She left behind her husband and her three children who where all under the age of eight. Alex’s father remarried two years after Jane’s death. 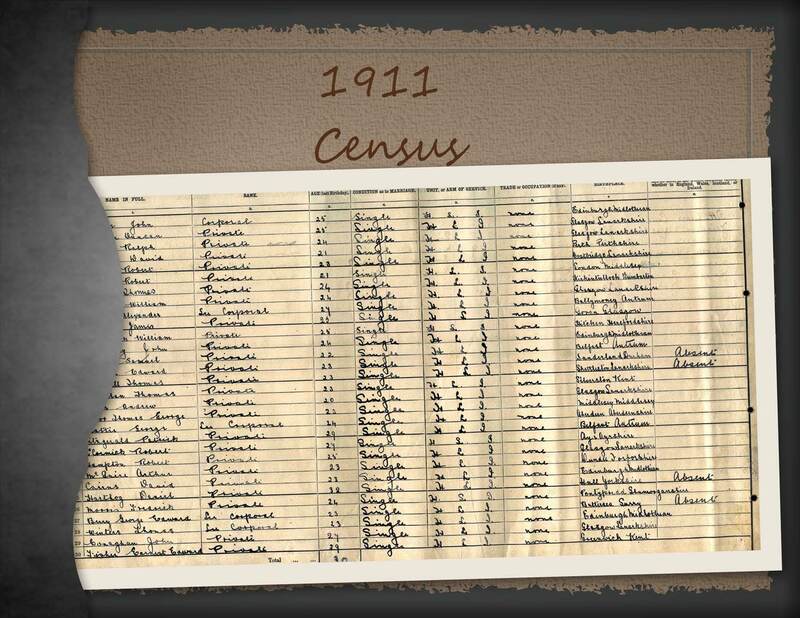 In the 1901 Scottish Census Alex was living at 46 Hutcheson Street, Maryhill, Lanarkshire, Scotland and working as a general labourer. 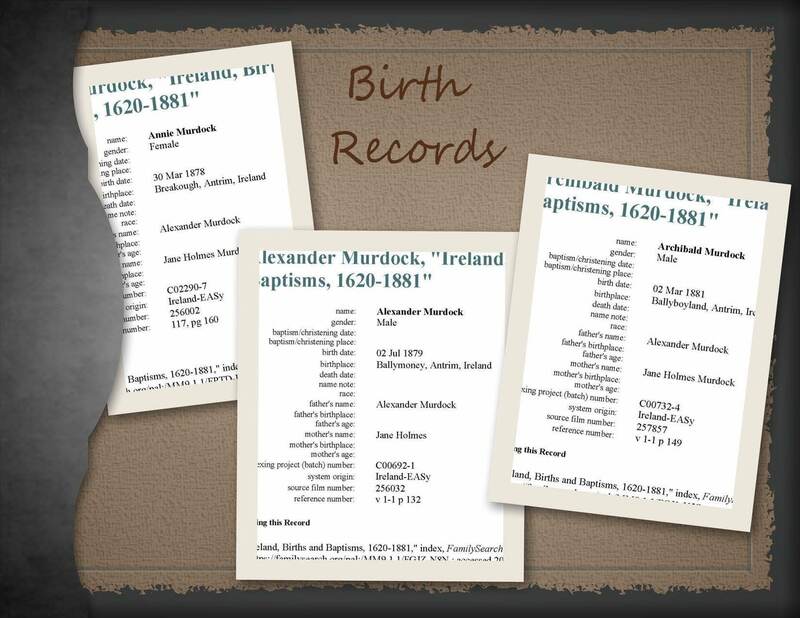 He was living with his aunt, Sarah Jayne Burkhill (nee Murdock); and family. It is unclear when he and his brother Archie had moved to Scotland. Annie remained in Ballymoney, having married in 1896 when she was still a minor. Fast forward ten years later, in the 1911 Census Return of all Commissioned Officers, Warrant Officers, Non-Commission Officers, Trumpeters, Drummers and Rank; Alex is listed as a Lance Corporal in the Highland Light Infantry. While living in Glasgow Alex had enlisted in Hamilton, Lanarkshire. “In January 1916 Alex was in hospital suffering from injuries but was improving and looking forward to ten days leave. 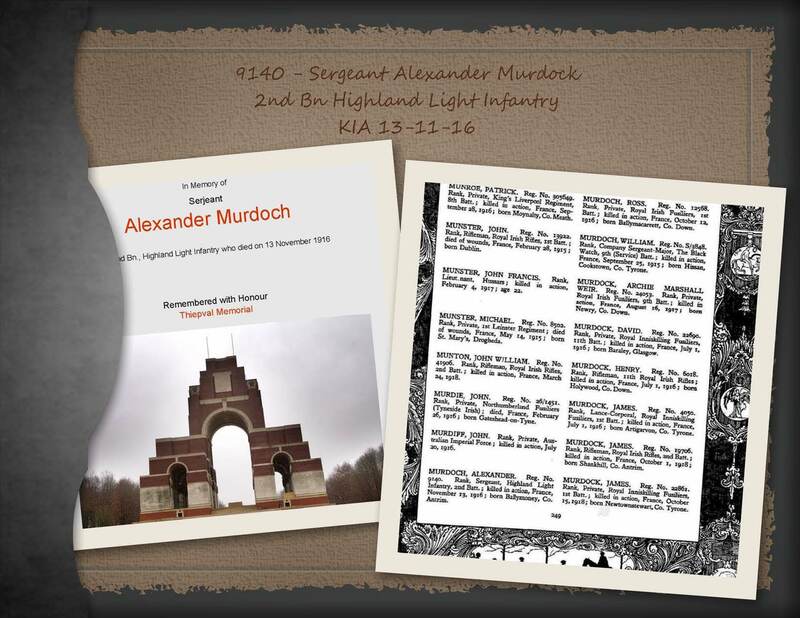 I have been unable to trace the family of Alex Murdock but he was with his battalion north of the River Ancre in October 1916. Alex is remembered in “Ireland’s Memorial Records – Soldiers Who Died in the Great War”; he is commemorated on the Thiepval Memorial, Pier 15 C. He has no known grave. Like so many others, Alex didn’t come home. 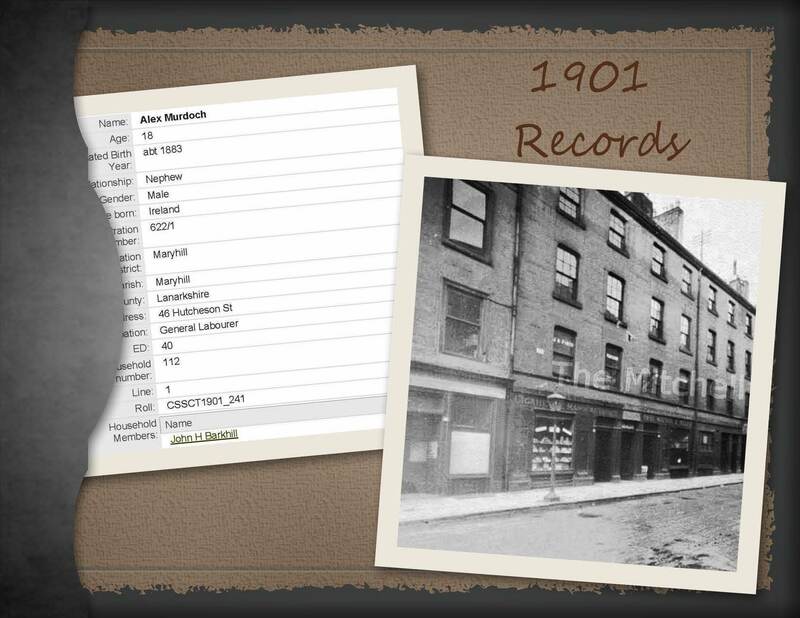 This entry was posted in Burial Records, Co. Antrim, Family History, Geneaology, Ireland and tagged Ballymoney, Burial Records, Co. Antrim, Family History, Geneaology, Ireland, Murdoch Family, WWI. Bookmark the permalink. Hi Vicki, thank you so much! I use a variety of computer programs; this particular one came with my HP printer; it’s called Photo Creations! Enjoy work!!! I’m looking forward to my 4 day weekend! Take care! hmmm lost my reply, so again….I just got a new printer but unfortunately it didn’t have any interesting programs like that…it is very good…must check online and see if I can buy it perhaps…anyway very clever and looks great. OK I have read this post. I do so love the way you write your family member’s history. So much passion, and empathy, and of course the history, the social history and the personal history makes it all so “real”. As of course it was. The World War I in particular has really taken my interest in the last few years. Maybe it is getting older? Have you read Sebastian Falks “Birdsong”. I didn’t think I would enjoy a novel about war, and it was just after I had huge major surgery in 2008, but I cried all the way through the book, but couldn’t put it down. Do read it if you haven’t, it certainly puts you right there. Once again a fabulous post, it’s like picking up a favourite book and finding a new chapter has suddenly appeared!! I am in awe of your writing skills, bringing these dear people to life. Hi Vicki, what a lovely compliment; thank you so much! I’m not sure what’s happened in the last few days; however, it seems my little blog has been found! I love that people are actually interested in what I’m writing about. It’s additional bonus; as I just really write the blog for me. BTW the printer I bought is an HP Officejet Pro 8600, which is what the software came from. Take care; I hope the Easter Bunny is good to you! Hi again, yes, I have been a bit slack of late, so busy working at night, but just organised to have tonight off (Thursday) so will have 3 nights off and back Sunday so I want to get into doing a post or two. Probably partly as a boost from the way you publish I have decided of late to just post interesting things I know about my ancestors. I was trying to do it in some sort of timeline order, but it is just too hard. I have posted one post about my gg grandfather, and as he was such a pioneer here with so many interesting stories about him I am going to go with the interest rather than the timeline although it would have been nice, but if I do that I will never post anything. It’s great other’s are reading your post. I would like that too, firstly I was hoping family would find it and enjoy it, but it does not seem to be the case, many seem to just want to take info straight from trees on ancestry.com and that is that. So, like you, I am hoping to cover the history side as well, what was happening at the time. As my father’s ancestors arrived here only 3 years after South Australia was proclaimed a colony, he was an “old colonist”, so there are many interesting stories and some newspaper and other stories or mention’s of him, so I will do that. As an ex librarian I have a love of research, and a love of history, so my aim has always been as you, to write a social history as well intertwining the cold hard facts. p.s. My new printer is an HP and I will check out the site, I did find a site for the photo program, although it says it is not available in all countries. But if I can download it I will and use it. If not I may be able to find something similar. Anyway, nice to hear back from you, keep up the wonderful writing, you have a fan in me….lol…cheers from Vicki again.